People who regularly use aspirin to reduce their risk of heart attack may need to pay extra attention to their eye health, a new study has found. Research conducted at the University of Sydney in Australia found that people who used aspirin at least once a week faced an increased risk of age-related macular degeneration (AMD) - a leading cause of blindness in older people. 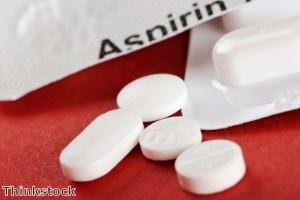 The scientists looked at data on 2,389 people, including 257 who were regular users of aspirin. They found that over a 15-year period, 63 of the participants developed neovascular or 'wet' AMD. Five years into the study, 0.8 per cent of non-regular aspirin users had developed wet AMD, along with 1.9 per cent of regular users. By the time the study ended after 15 years, the disease's incidence had increased to 3.7 per cent of non-regular users and 9.3 per cent of regular users. Dr Gerald Liew and his colleagues concluded: "Regular aspirin use was significantly associated with an increased incidence of neovascular AMD." Aspirin is commonly used to prevent heart attacks and strokes in people with risk factors for cardiovascular disease, but the researchers noted that the link between aspirin use and AMD appeared to be independent of people's history of cardiovascular disease. It also did not seem to matter whether a person smoked or not, according to a write-up in the journal JAMA Internal Medicine. While patients are not advised to stop using aspirin on the basis of these findings, it may be worth investigating more natural approaches to cardiovascular protection, which could reduce their reliance on aspirin and other drugs. For instance, a natural health supplement such as NKCP NattoTabs are used by some people with circulatory problems to support healthy blood flow. These easy-to-take tablets contain an enzyme extracted from the Japanese delicacy 'natto', which has been recognised for more than 2,000 years for its cardiovascular benefits. NKCP NattoTabs enable people to benefit from natto's health-giving properties while avoiding the unpleasant scent and taste of the original food.